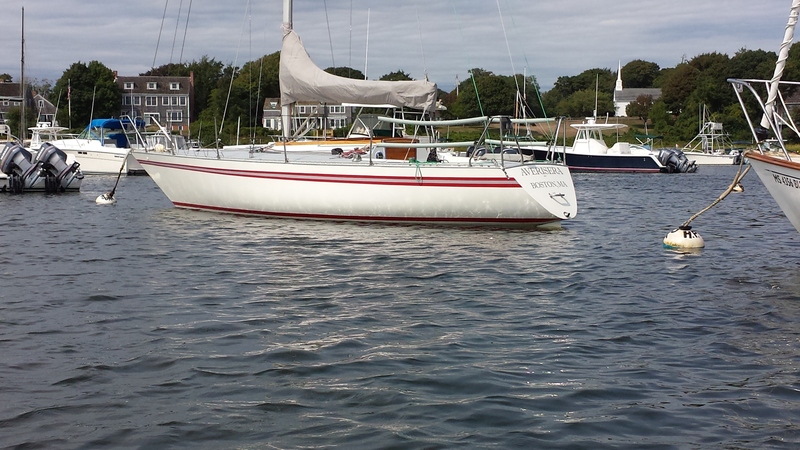 Elizabeth and Norm got off Cape (end Sep '16) to visit friends Tom and BJ in Kittery, ME then help Tom with Race Committee for the Gosport Regatta. The Regatta is held as an end of year pursuit race starting off Portsmouth, NH and finishing off the Star Island Resort on the Isle of Shoals, NH. 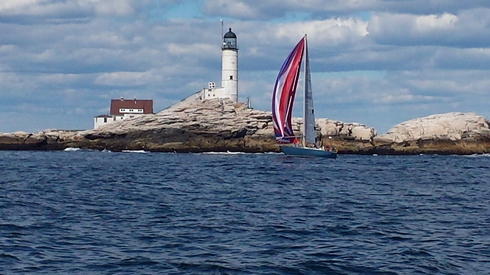 The top finishers, Frers 30, DEFIANT, and J24, second by a nose. 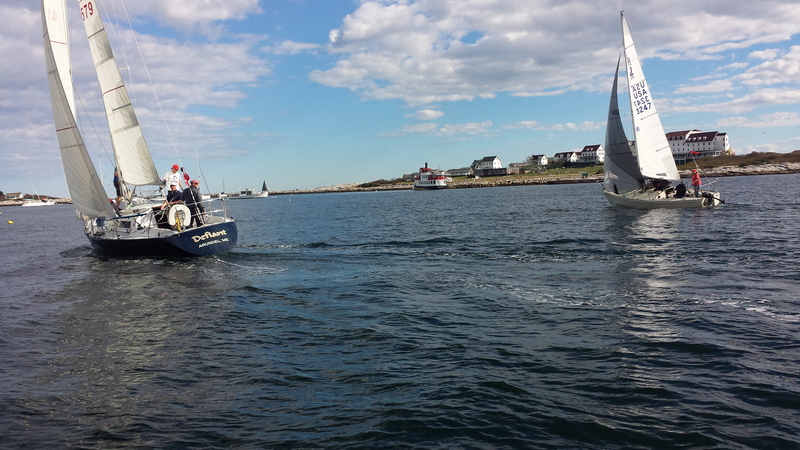 The race featured a nice breeze, no breeze, a nice breeze, no breeze and then the race ended. 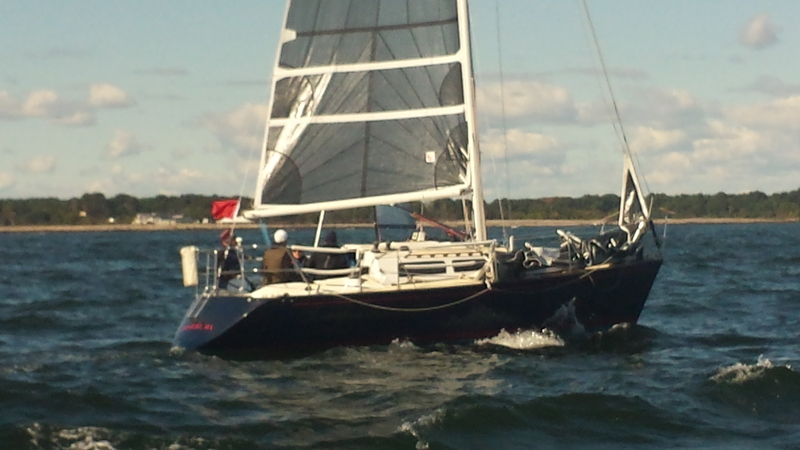 And the wind blew up to 20 knots until we left that evening. The engine room is getting a upgrade. While Thumper is in the hospital we took the time to redecorate the Boom Boom Room where Thumper lives. First, we ripped out the old foam which I don't think offered much sound deadening any longer. Second, we glued on a new layer of high density foam we had left over from our renovation of our berth mattresses. Finally, we cleaned, degreased and spray painted the space. Sea Foam Green. Seriously? It was the best color from our stock of spray paints. 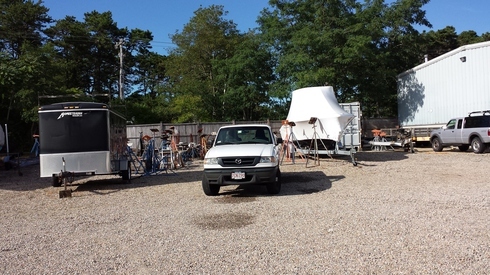 When/if we have the opportunity before Thumper comes home, we'll layer on a few more coats of sea foam green paint. 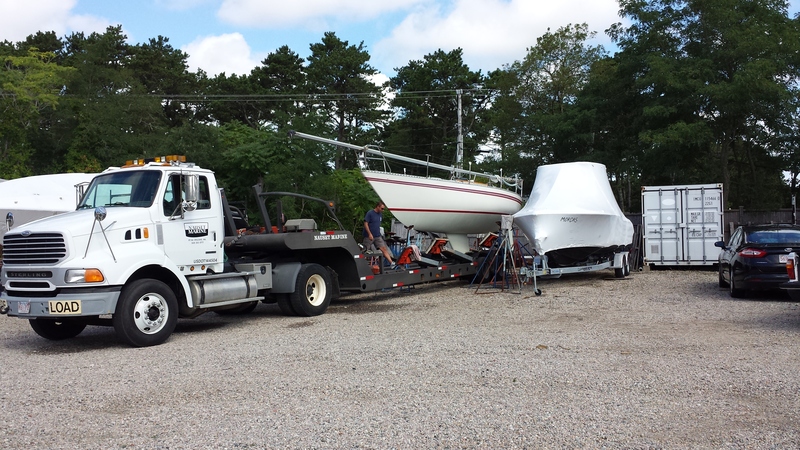 Yanmar grey goes with everything? 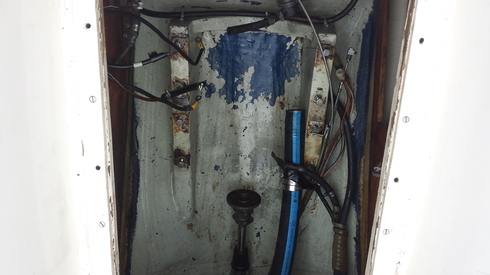 The opening on the left side of the image is a hatch used to access the engine mounting bolts. We don't know why there is only one hatch on one side. Need be, we'll cut another hatchway. 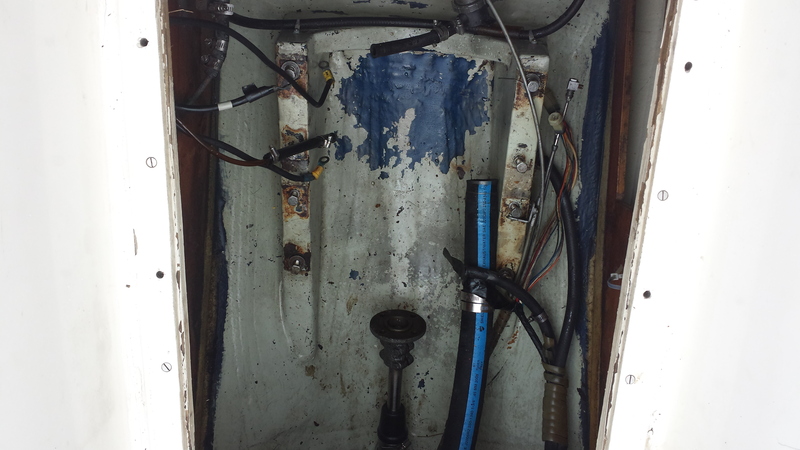 One of the endless chores to complete is cleaning, degreasing, sanding, and painting the bilge. It is not that the bilges are dirty or difficult to access, they aren't. 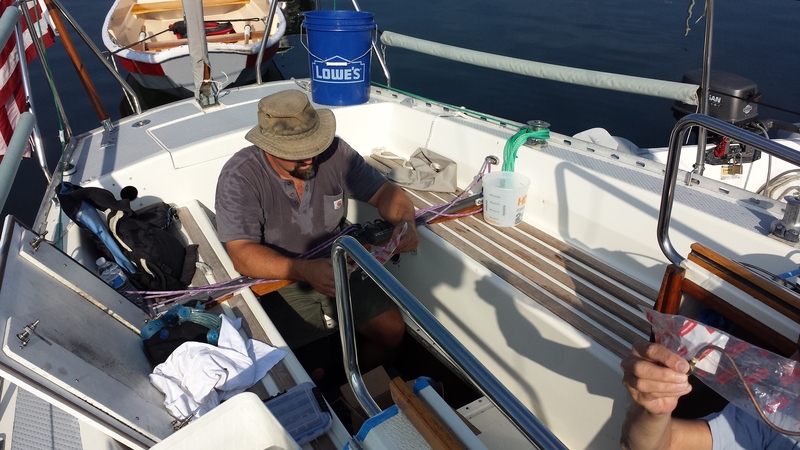 The boat is small and the sturdy construction makes for a very fussy job. 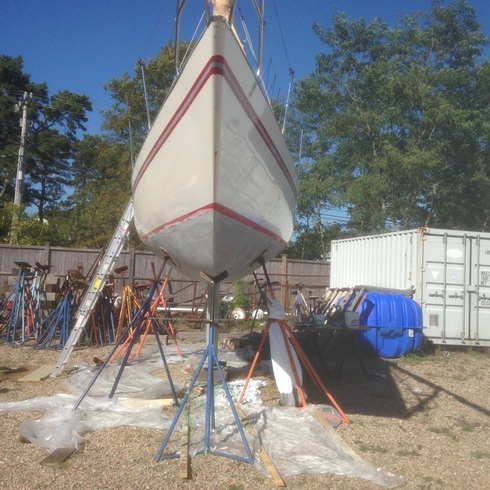 The first coat of spray paint suggests the effort will be sufficiently rewarding. A view from Averisera as we lie on our Harwichport Boat Yard mooring. 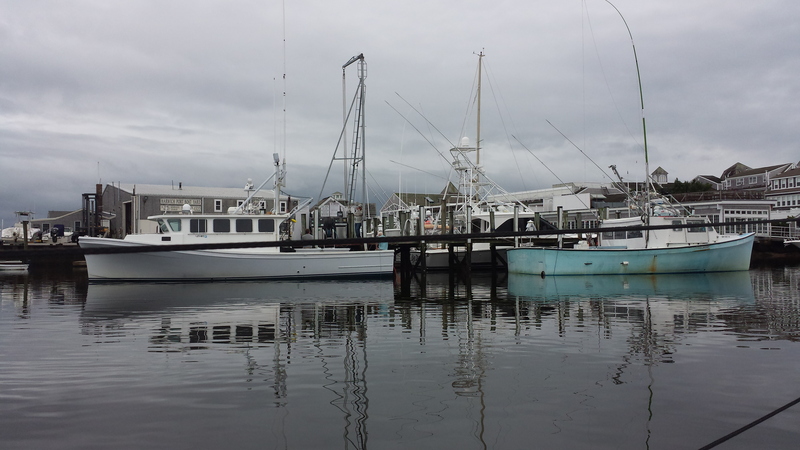 It is calm and the tuna boats are fueling before making another run on the fishing grounds. We also got a new decal for the dinghy, Giddy. 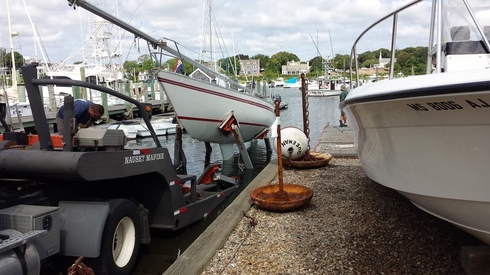 Dinghies need to be identified with owners or boats. It is just the way its done around here. The Nutshell pram came with the name and it suits. T/T means Tender To. Thumper the Yanmar 1GM is in hospital. A private room on Dan's bench. Thanks Dan. Ross is doing his very best to make Thumper whole including statements like, "I have that part in my attic." We aren't worried. Elizabeth is more worried Norm will execute on his two 12 foot sweep plan. 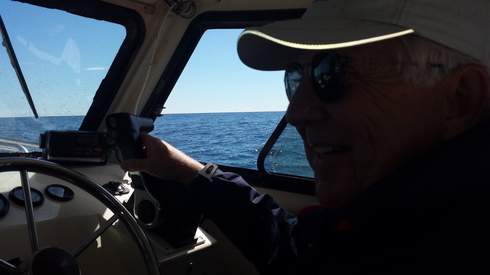 Long story made too short: one involving my mom rowing their 26 foot US Navy whaleboat/lifeboat with 12 foot sweeps while dad steered. Honeymoon cruise? Uh huh. They were married for well over 60 years and mom never rowed dad again! A story Norm has told more than once. 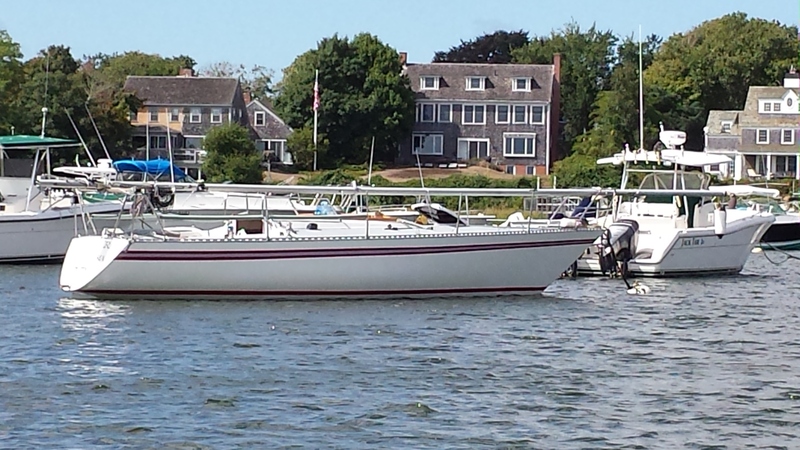 There is another story about dad being asleep aboard and not rowing in to pick up mom one night. Oh boy... he only did that once. 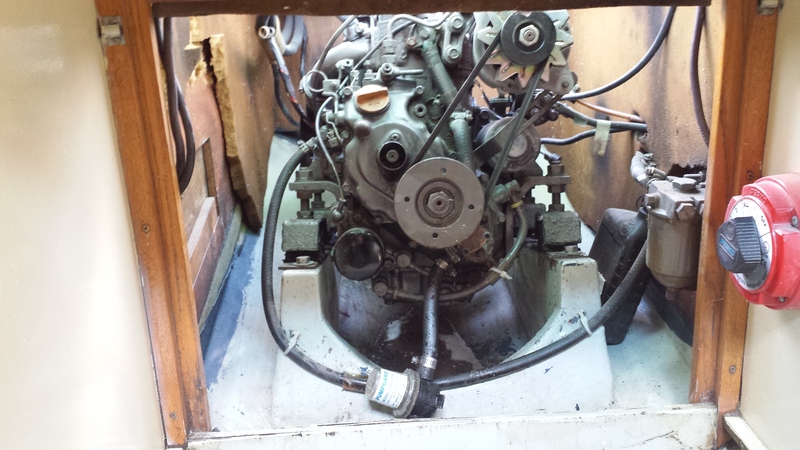 Thumper, our diesel engine, is coming out for a rebuild. The rings are bad and we are burning lubricating oil as well as the intended diesel fuel. Today, we detached all the stuff thats attached. Well most of it. Thumper is a Yanmar 1GM probably from 1984. More to follow. 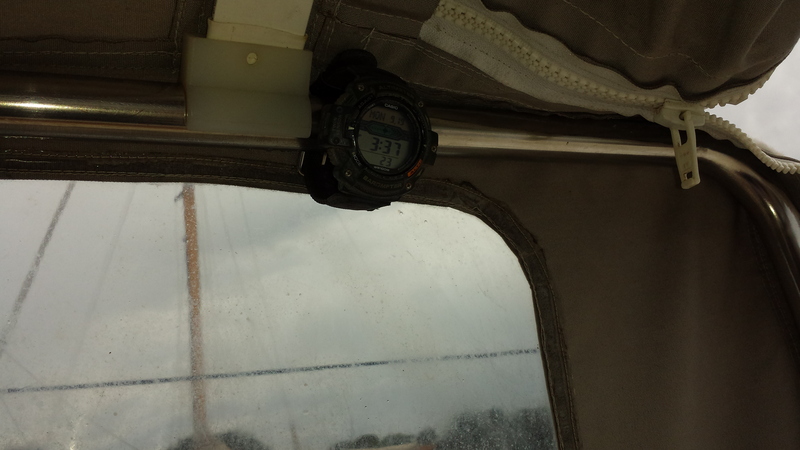 We installed a new Hawk Eye Depth Meter yesterday while afloat. 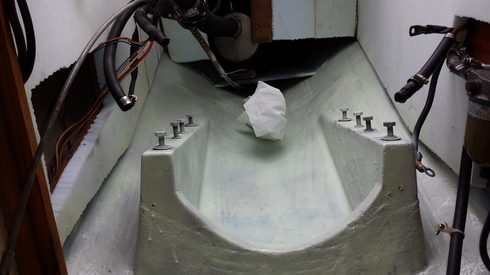 The sender/transponder sends a signal through the solid fiberglass hull so no through hull is required. Pretty cool. We glued the transponder in place with a Pettit product that meets the requirements of being clear, thick, and slow-cure. 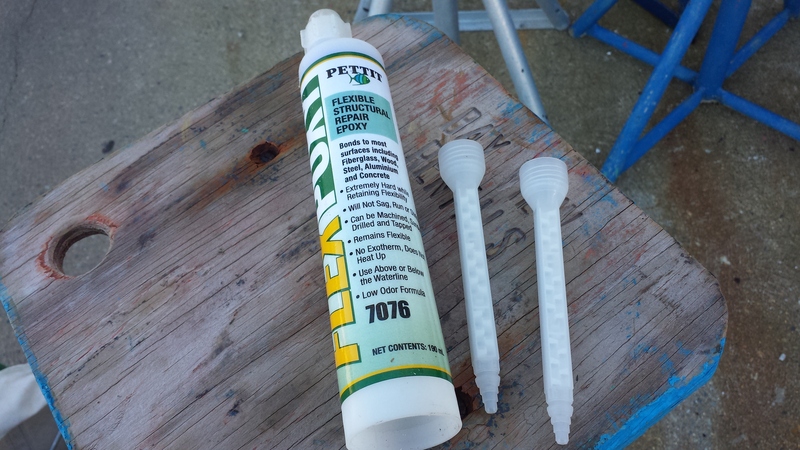 The epoxy mixes in the nozzle and comes out without air bubbles. I made a small dam from some clay which turned out to be unnecessary. 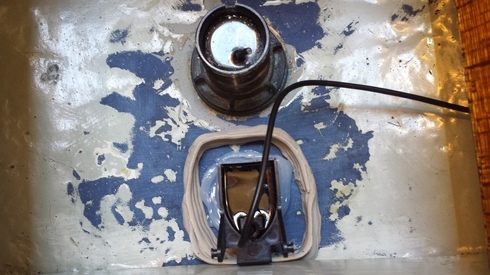 The transponder was simply squished into place. We turned the device on and bingo... it worked. 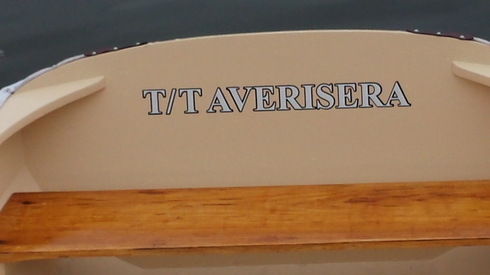 We keep things simple on Averisera. Our knot meter is in the GPS and a wrist watch keeps our time, barometric pressure, temp, etc. Hawk Eye Depth isn't fancy. 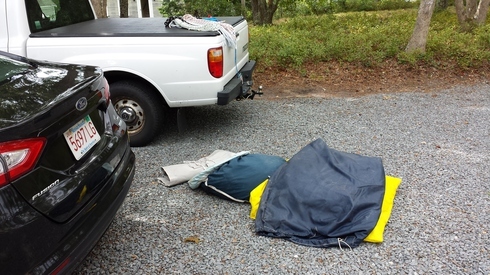 It was priced right, got good reviews and seems to work. How about that? Simplicity. We will give a good review, too. After launching and waiting out tropical disturbance Hermine we have worked steadily to get the boat to this state of play: rigged and ready. Along the way a few adventures. First the boat floods at launching. 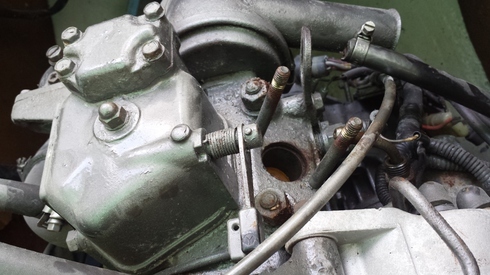 Then the engine won't start and we replaced the head and exhaust elbow. Then the Pipe C, lube oil delivery, broke open and we replaced all three pipes. Then the shaft log seal, a dripless seal, began to leak. Not a lot but compared to never before, a lot. See the entry for July 26, 2010 when we replaced pipes B and C. Now we have all new Pipes, A, B, and C. Should have done A when we were doing B and B. We have also met some very nice folks at Wychmere Harbor. 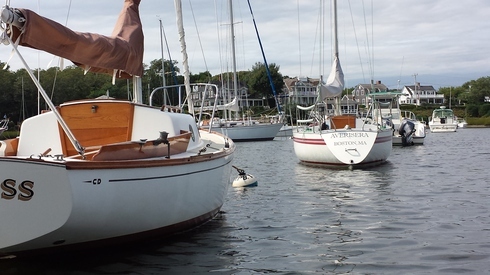 The Legnos 20 cat boat, Bristol 32, and Cape Dory 22 are nearby and make for some nice conversation. Can't forget George on his custom 35 footer. He has the prettiest strip planked dinghy, beautiful wineglass transom. Zachary working on the lube oil pipes, Pipe A on display. Sails ready to be taken to the boat along with a lot of other things except for the sail ties, winch handles and one other thing I can't remember. Alongside the Stone Horse YC dock to load the items too awkward to ferry by dinghy. The nutshell pram awaits our return to the mooring. Pretty boat getting some hard use. that why we have it! The Cape Dory 22 and Bristol 32. 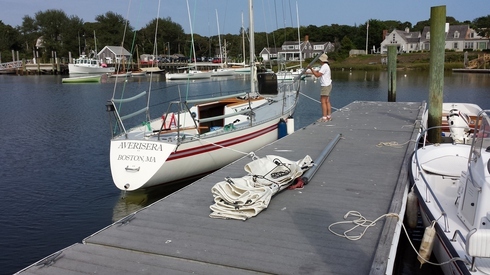 Both owners are new to sailing. 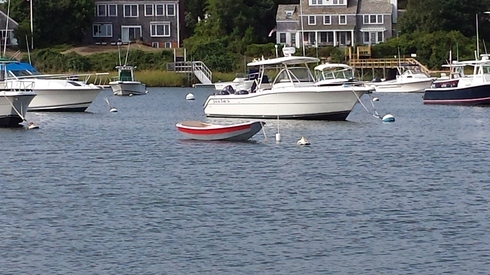 The Bristol family dinghied out to just sit on their boat for the first time since its delivery to Wychmere Harbor. We rowed over to chat as we headed home saturday evening. This (above) not that (below). 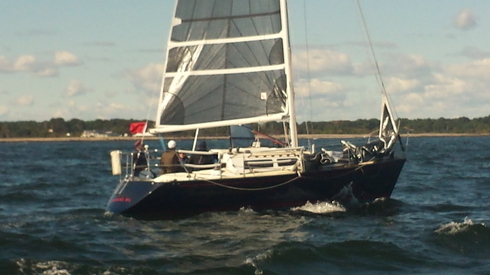 We hauled out in September of 2014 (above) and re-launched two years later. It was quite a refit! 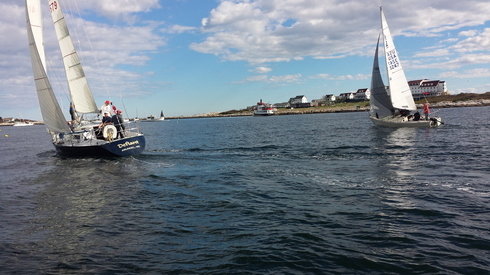 Nauset Marine put us into the slot and pulled us away from the place. Thanks! 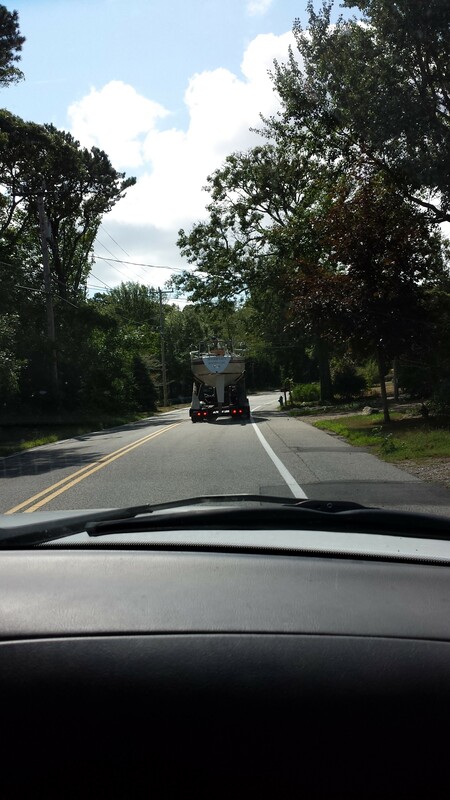 Grandson, Zephyros, took a few pictures as we followed Averisera down the roads to Harwichport Boat Yard. Oh no! 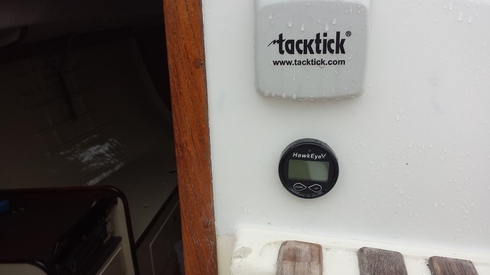 Norm failed to install the knotmeter through-hull plug and we nearly flooded the boat. Fortunately (ha) everyone was there so we get sinker jokes now and so on. Zach showed up with electric pumps. All is well in that the boat is dry and the hole plugged. See the white bottom below the red boot stripe? That's good. In other news. Thumper wouldn't start so we bled the fuel lines, removed and tested the injector. All good. Ripped off the head. All bad. 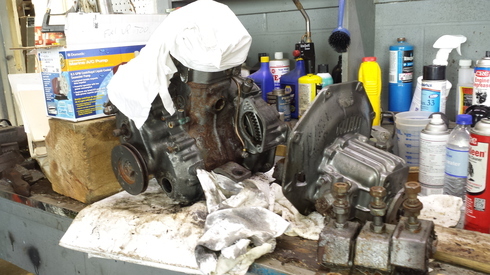 New head and exhaust ordered and our special genius, Zach, will help us rebuild the engine. Thumper will be better than ever. During the launching time, the Cambridge Grands and their parents were around and made the launch an even more special event. The mast goes up as soon as we get a break from the Tropical Storm, Hermine.